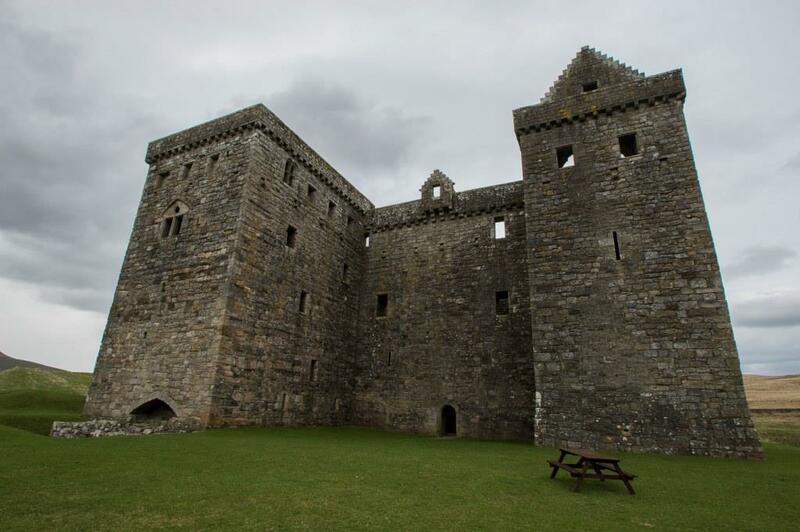 Hermitage Castle is a grim-looking fortress set in the hills of Liddesdale in the Borders. Possibly from the French Armitage (Guardhouse) the castle certainly guarded the route through Liddesdale, one of the important upland routes from Carlisle to Edinburgh. It consists of a rectangular courtyard which had square towers at the corners, one of which was larger than the others and acted as the keep. The east facing, and west facing profiles of the castle have been altered by joining the towers themselves at second floor level to provide continual accommodation over the top of the void beneath. The south-western tower – the keep – was extended to provide further room within the castle. Hermitage Castle has a complex set of earthworks which were probably erected by the Dacre family and may date to the 13th century. The ditches would perhaps have been filled with water from the Hermitage Water. The castle then passed to the de Soulis family, who would have strengthened it – perhaps building in stone – prior to the invasion of Edward I in 1296. The family lost the castle after a failed assassination plot against Robert the Bruce. The castle changed hands several times during the Wars of Independence, and was eventually granted to the Douglases, who reconstructed the castle to largely its current plan. Following the fall of the Earls of Douglas in the mid 15th century, it passed to the Douglas Earls of Angus, who exchanged it with the Hepburn Earls of Bothwell. Eventually it reverted to the Crown to be granted to Scott of Bucclecuh, Warden of Liddesdale, but Hermitage Castle fell into disuse after James VI became King James I of England in 1603. Partly restored in the 19th century, it is now managed by Historic Scotland.